Even with Legacy auth disabled, you can successfully run Connect-PNPOnline. Video demo shows changing SPO tenant security, then how to register new AppId for Connect-PNPOnline access to all site collections in tenant. The “AppRegNew” and “AppInv” ASPX pages can be used to establish authentication channel for PowerShell work in PNP on Office 365 tenants where Legacy Auth is disabled. Connect-PNPOnline -AppId "e419e703-5293-402c-bb70-3aff593b850b" -AppSecret "secret-here"
By default this value is set to $True. Setting this parameter prevents Office clients using non-modern authentication protocols from accessing SharePoint Online resources. A value of True- Enables Office clients using non-modern authentication protocols (such as, Forms-Based Authentication (FBA) or Identity Client Runtime Library (IDCRL)) to access SharePoint resources. A value of False-Prevents Office clients using non-modern authentication protocols from accessing SharePoint Online resources. This may also prevent third-party apps from accessing SharePoint Online resources. Also, this will also block apps using the SharePointOnlineCredentials class to access SharePoint Online resources. For additional information about SharePointOnlineCredentials, see SharePointOnlineCredentials class. 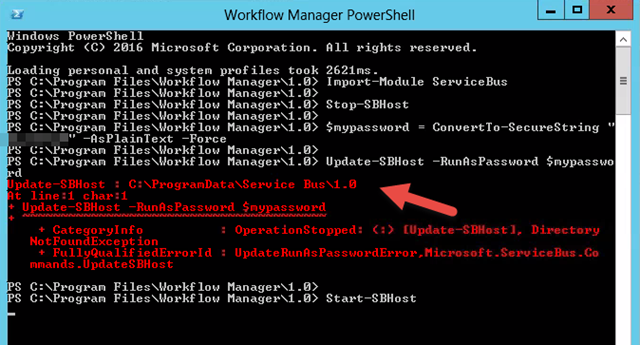 While running Update-SBHost I saw the error below. The fix (admittedly strange) was to rename the application folder. Seems internally SB expects “1.0” in the folder path. When running version 1.1 it appears we must rename the folder to “\1.0”, run the “Update-SBHost” cmdlet, and rename the folder back to “\1.1” in order for the Update-SBHost to complete successfully.